Looking at the thumbnails below you can find out a lot about the vignetting performance on the small sensor of the Canon EOS 50D. The measurements don’t show anything worrisome. At the maximum relative aperture the light fall-off in the frame corners amounts to 28% (-0.93 EV) which we consider a medium value. The problem disappears almost completely on stopping down to f/2.8 where the vignetting level decreases to 9% (-0.27 EV). Much more problems you can find on full frame and the photos, presented below, show it clearly. 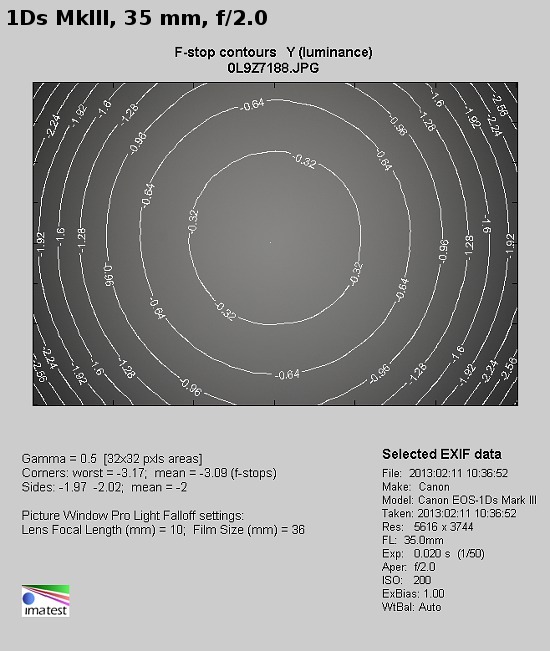 Using the maximum relative aperture means you lose 66% of light (-3.09 EV) in the frame corners. It is really a lot so this result can be only described as weak. 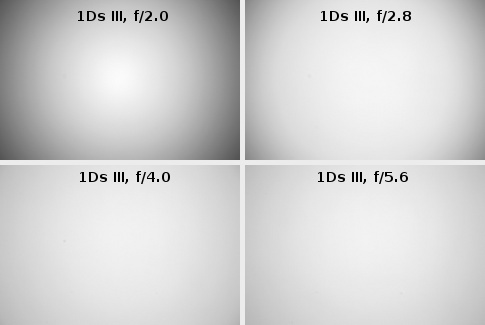 Some 1.4/35 lenses can lose less light by f/1.4 not to mention their performance by f/2.0. On stopping down to f/2.8 the Canon 2/35 IS shows 44% of vignetting (-1.67 EV). By f/4.0 the problem is still perceivable, amounting to 25% (-0.83 EV). Further stopping down doesn’t influence this aberration much – both on f/5.6 and on f/8.0 we got the same result – 22% (-0.74 EV).